The performance of any equipment indoors in a controlled environment or inside of a lab is much different than the performance of the same equipment in outdoor conditions. The change of seasons, various weather patterns, and temperature fluctuations can make a big difference in the effectiveness and efficiency of the machinery and its components. When it comes to a hydraulic system, these environmental changes can have an even more significant impact. Safe replacement hydraulic hoses and regular inspections go a long way toward preventing blowouts and other failures, but there is more that you can do. Let’s face it; we get a lot of extreme temperatures, snow, ice, rain, and hail in the northeastern states during the winter. You need to either be prepared to withstand it or be ready to experience downtime while you deal with hydraulic hose replacement. Metro Industrial works to provide our customers with professional services designed to expedite the replacement experience at our hydraulic hose repair shop near Fall River. We can create custom hydraulic hoses while you wait, provide professional assessment and consultation for hydraulic hose replacement, and offer other valuable services. If you use the wrong hydraulic hose in the extreme cold, the materials used to make up the inner tube and cover of the rubber hose will no longer behave in the manner that they were designed to perform when they are cooled to very low temperatures. These materials can become stiff, hard, and even brittle, depending on how much time they spend in the cold. 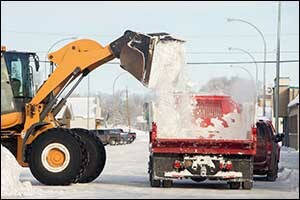 Cold weather equipment, including heavy-duty construction machinery, snow plows, and other essential gear often depends on hydraulics for operation. It is critical to take the time to learn more about the extreme temperature requirements for safe use of hydraulic hoses during the winter in Fall River and the surrounding area. So now you know that hydraulic hose can become hard, stiff, and brittle in cold weather, but it is also good to know why this happens. At normal operating temperatures, the internal tube and external cover materials have sufficient energy to allow for proper function and flexibility within the hydraulic hose. As the temperatures drop, the elastic nature of the materials can become tough and leathery. When the temperature drops even further, the now leather-like material can become brittle in the freezing cold and shatter, causing leaks within the hose, requiring safe replacement of hydraulic hoses for effective and efficient operation. Custom hydraulic hoses while you wait can be provided at Metro Industrial to best meet your needs for safe operation. Hose manufacturers use cold flexibility testing procedures and guidelines to design and rate their products. You will need to get a tube that will not crack or leak under extreme temperature or experience problems when it is warmed back up to more normal operating temperatures. Check the manufacturer’s recommendations for the equipment to determine the best type of hose that should be used for your equipment in the winter months. Even fine cracks that can form on hoses during very low-temperature weather conditions can result in serious internal damage and dangerous leaks. Contact Metro Industrial for safe replacement of hydraulic hoses year-round. Visit our hydraulic hose repair shop near Fall River to get hydraulic hose replacement that is rated for cold-weather operation. As a local company that provides industrial supplies and services to customers in the Greater Fall River area, we can offer assistance in finding the best solutions for hydraulic hoses while you wait. We stock a variety of hoses with different pressure ranges, temperature ratings, and reinforcement layers to ensure safe and effective use during any type of conditions. Give us a call at 508-996-8400 to speak with one of our technicians about your needs or to get details about our hours of operation and directions to our store in New Bedford, MA. We can answer any questions that you might have about the safe replacement of hydraulic hoses, custom hose assemblies, or even help you with all of your other industrial supplies and services needs. Call today to learn more about our custom hydraulic hose assembly solutions.